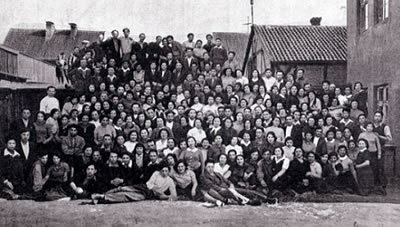 Young people planning to make aliyah in the 1930's. Remember Emily in “Our Town” returning to the days when she was growing up? I’ve taken a similar trip -- only instead of a small village in New England I’ve been transported to a small shtetle in Lithuania in the 1920’s, a town that up to a few short months ago I never knew existed. The name of the town was Rokiskis, which was the Russian name, or Rokishok in Yiddish. It was my father’s birthplace. I had always pictured my father’s town as a dismal and backward place, consisting of nothing but shabby houses inhabited by downtrodden, provincial souls leading hopeless, dreary lives. Now I know that this was as far from reality as a Hollywood movie is remote from real life. What brought me to this sudden awakening? A book, of course. But a special kind of a book -- a yizkor book. A 620-page memorial dedicated to the town of Rokiskis and its surrounding communities. This tremendous effort of love and devotion was produced and published in Johannesburg, South Africa in 1956. Painstakingly put together -- to almost the point of obsession -- by a landsman thousands of miles away from the land of their birth. Through the hundreds of photographs appearing throughout the book, the town came to life in front of my eyes. Photographs showing marvelous faces -- intelligent, learned, cultured. Here they were -- at social gatherings, participating in musical entertainments, rowing out on the lake, posing proudly before the start of a Maccabi or Hapoal game. Here are members of a Zionist youth group, planning new lives on a future kibbutzim; frolicking young men and women gathering for a springtime picnic in the woods; executives of the Jewish Peoples Bank, posing stiffly in front of the camera. Here are the volunteers of the benevolent society, the caretakers of the orphanage. But where the downtrodden souls of Anatekva? It became apparent to me that Rokiskis was not an insignificant dot on the map. Indeed, it was not a small village at all but a commercial center; a major stop on the railroad line connecting Riga, the capital of Latvia, with the country of Lithuania. It was, truly, a queen bee. Here also are photos of the humble folk - the water carriers, boot makers, tailors, candle makers, metalworkers, clock makers, ritual slaughterers , peddlers. One thing I noticed immediately was how attractively all the people were dressed. The women looked stylish, fashionable, the men handsome in their formal business suits.. After all, this was Rokiskis! No country bumpkins they! I was one of those unfortunate children who never knew any of my grandparents. My maternal grandparents both died in Brockton, Massachusetts before I was born. My paternal grandparents were lost, along with my father’s many brothers and sisters. That’s why, my mother would patiently explain to me. that my father never laughed or joked like the other fathers I saw portrayed in the movies that I went to every Sunday afternoon. There was a terrible war going on in the “old country”, and no mail was received from this devastated place. I especially thought about that beautiful little girl whose photograph was in our family album. She could have been my good friend and soul-mate. She could have grown up, married, had a good life. All my life I had heard that “no records were kept in the ‘old country’. Nothing could be further from the truth. The Russian government kept records, all right -- hundreds upon thousands of records. Not only vital records, births, marriages, deaths but especially who paid taxes and when. What those good people of South Africa strove to do was to record life as it existed before the Holocaust. Now comes another amazing discovery. My father’s family, the Schwartzbergs, were active leaders in this community. They were pictured in so many of the photographs.. There was Ethel Schwartzberg in a Young Peoples’ League. There was Yeudit Schwartzberg, stylishly dressed and coiffure, strumming a guitar. There was Ephraim Schwartzberg, a participant in the Bow and Arrow Club. Ah, there was Yeudit again, posing in front of a statue, and Yeudit, still again, dressed up as an ancient gypsy in a amateur theatrical, and Yeudit again, with about seven or eight other women gathered together and clutching huge paper-mache valentines. The Rakisher Landsmanschaft express their warm thanks and appreciation to their chairman, Mr. Aarons, and his wife, Ethel Schwartzberg Aarons for their devoted and tireless efforts in the publication of this book. Toward the final pages at the end of the book, I came across a list of those families who left Rokiskis. One family to nearby Vilna. One family to South Africa, Another family to Israel. But no mention of my immediate family members. They were not listed because they did not get out. I am blessed with a son who slowly and painstakingly is deciphering the Yiddish captions under each of the photographs, helping us to reconstruct the details of my long-gone relatives’ daily lives. These people are well known to me, their deep love for each other evidenced by their posing joyfully arm in arm. A few short years later, in the summer of 1941, perhaps a beautiful, sunny summer like this one in 1998, it all came to an end. 1941, a year that stands out in my mind because it was the year my elder sister graduated from high school. 1941, the year they were gone. Except for the photos staring out at me. Frozen in time.